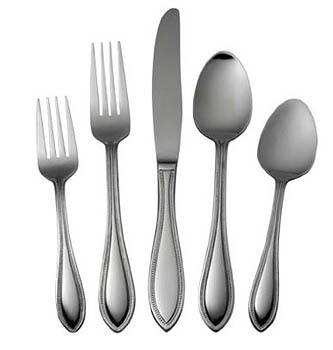 International American Bead Flatware Set – So what is Bead Cutlery? This 53-piece set from International Silver is a setting for 8 people with 8 steak knives, 2 serving spoons, a serving fork, butter knife and sugar spoon. It’s 18/0 stainless with a classic looking teardrop design and it is a good value. But it brought to me the question, what is Bead Flatware? I first thought it was bead blasted for a matte finish, but that isn’t the case. Bead cutlery or better named “beaded” is the decorative design of tiny little beads along the handles. So now you and I both know, we learned something today.